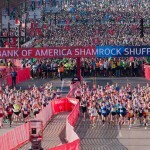 CHICAGO – More than 30,000 runners filled the streets of Chicago for the 35th anniversary Bank of America Shamrock Shuffle 8K. Cool temperatures and sunshine brought runners out in full force for a tour of Chicago’s Loop, followed by a Post-Race Party at Buckingham Fountain. The first runner across the finish line was Jacob Riley, 25, of Rochester, Mich., in 23:06. The women’s winner was Katie Kellner, 22, of Rochester Hills, Mich., in 27:13. Both winners are members of the Hansons-Brooks Distance Project. Riley, who came in second place at the 2013 Bank of America Shamrock Shuffle 8K was thrilled to break the finish tape this year. 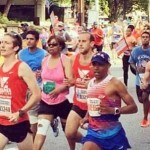 He narrowly beat out his teammate Brendan Gregg, 24, of Rochester Hills, Mich., with a time of 23:09. Dan Lowry of Ann Arbor, Mich., came in third with a time of 23:17. This was women’s winner Katie Kellner’s first Bank of America Shamrock Shuffle. A recent graduate of Cornell University, she beat out Laura Batterink of Evanston, Ill., with a time of 27:30. Third place finisher was Danna Herrick from Urbandale, Iowa, with a time of 27:37. In the wheelchair competition, Bobby Swanson from Round Lake Beach, Ill., won the Bank of America Shamrock Shuffle 8K title in 25:38. The women’s wheelchair champion Kendall Gretsch from Downers Grove, Ill., finished in 26:33. 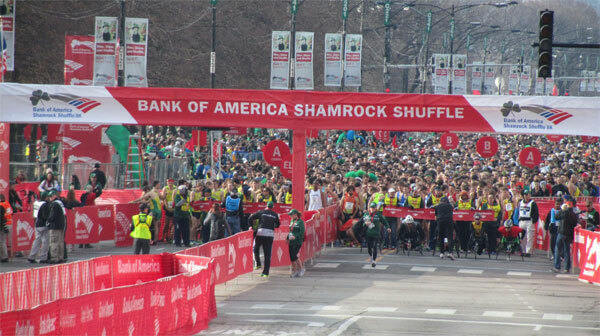 The 2014 Bank of America Shamrock Shuffle 8K included the second consecutive USATF National Club Team 8 km Championships, featuring 47 elite club teams from around the country. This is the third year in a row Michigan-based Hansons-Brooks Distance Project won both the men’s and women’s elite individual titles. The men’s team title went to Playmakers Elite out of Lansing, Mich., with a combined finish time of 1:35:08 among their top four finishers. They were led by third-place finisher Dan Lowry with a time of 23:17. The women’s team title was captured by Hansons-Brooks Distance Project with a combined finish time among their top three finishers of 1:24:38, led by female winner Katie Kellner. Rounding out the top three teams in the men’s team competition were the Twin Cities Track Club from Minneapolis, Minn., (1:37:55) and Movin’ Shoes Race Team from Madison, Wisc. (1:37:56). In the women’s team competition, Twin Cities Track Club (1:25:06) and New Balance Chicago (1:25:26) were second and third, respectively. 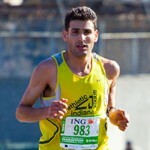 To access photos from today’s event, go to www.shamrockshuffle.com/mediaphotos.